Jack Eichel’s goal against Montreal means he has scored against every NHL opponent (Harry Scull Jr./News file photo). MONTREAL — It's now over for real. The Buffalo Sabres' playoff hopes, left for dead weeks ago, were officially put to rest Saturday night with a 7-4 loss to the Montreal Canadiens in Bell Centre. At 71 points, the Sabres are 16 behind both Montreal and Columbus with eight games left. And even in the highly unlikely scenario of winning all of those games to finish with 87 points, Buffalo would only equal those teams' total and will still be behind them on the regulation/overtime wins tiebreaker. The Sabres have missed the playoffs eight straight years, dating to 2011. If Carolina makes the postseason this season — and the Hurricanes currently join the Habs in holding the East wild-cards — Buffalo will have the longest postseason drought in the NHL. Montreal won Saturday's game with a four-goal second period as Max Domi and Andrew Shaw collected two points apiece. Brendan Gallagher had two goals, one in the second and another in the third. Domi and Tomas Tatar finished with a goal and two assists apiece, with Tatar wrapping up the game on an empty-net goal with 2:13 to go. The Sabres fell to 31-34-9 overall. They are 1-6 in their last seven games, 1-8-1 in their last 10, and 3-13-2 in their last 18. And for deeper perspective, they are 14-28-7 since their end of their 10-game winning streak on Nov. 27. That's 30th in the NHL in that span. It was also Buffalo's 11th straight road loss (0-9-2) and prevented the Sabres from recording their first season series sweep of the Habs since 1983-84. Middle-period blues: The Habs' four-goal second period outburst gave Buffalo 93 goals against this season in the middle 20 minutes, tied with Detroit for 30th in the league. The only team that has given up more is Ottawa (102). The Sabres' minus-29 goal differential in the period is 30th and ahead of only Detroit's minus-30. Montreal outshot Buffalo, 20-7, in the period. Jumping in front: The Sabres took a 1-0 lead at 12:26 of the first period on Sam Reinhart's quick shot from the slot off a Casey Mittelstadt feed. It was Reinhart's 19th goal of the season -- and first in 11 games. It was also his 200th NHL point. Beauty to tie it: The Habs made i t 1-1 at 5:09 of the second as Artturi Lehkonen had a tap-in at the goalmouth on an Andrew Shaw feed. But the real play was the spin-o-rama pass from Max Domi to Shaw for Domi's 40th assist of the season. Sabres get it back: Alex Nylander took a Dahlin feed for a howitzer of a one-timer at 14:53 and Marco Scandella went bar down off a Johan Larsson drop pass to tie it at 16:08. Sizzling Swede: Nylander has scored in consecutive games for the first time in his NHL career and has points in a career-best three straight games with two goals and two assists. The go-ahead goal: Former Sabre Paul Byron snapped the 3-3 tie with 1:57 left in the second period, tipping home a rebound on another 2-on-1 after a terrible giveaway by Reinhart at the Montreal blue line sent the Habs away. 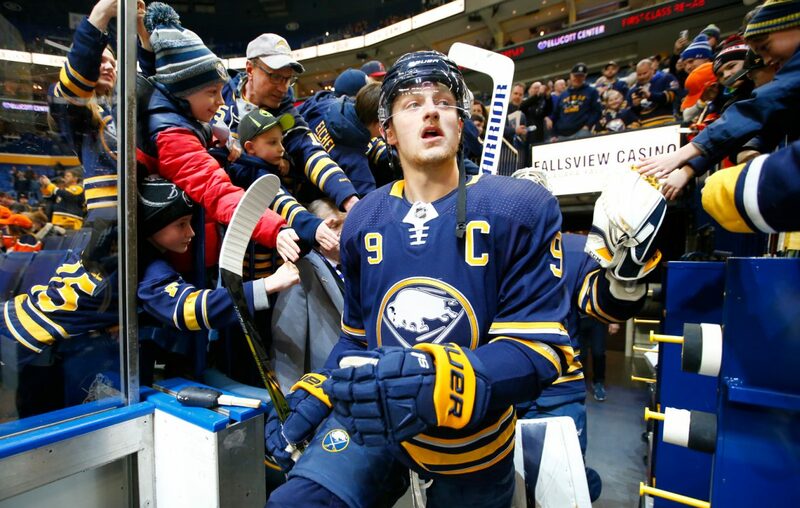 Brief hope from Eichel doused: Sabres captain Jack Eichel scored his 26th of the season with 6:47 to go to bring Buffalo within 5-4. The goal was the first of Eichel's career against Montreal in 16 games against the Habs, and means he has now scored against all 30 NHL opponents. But Montreal took its two-goal lead back as Domi scored on a screened shot on a power play with 4:30 to go. In the house I: Former Sabres and Habs defenseman Josh Gorges, who retired last year after his fourth season in Buffalo, got a big hand from the crowd when he was shown on the jumbotron in a suite. He was in town for an afternoon fantasy camp. In the house II: More big cheers came when former members of the Montreal Expos were shown in another suite, including Larry Walker, Dennis Martinez and Bill Lee. Olympic Stadium, the Expos' former home, will host an exhibition series Monday and Tuesday night between the Toronto Blue Jays and Milwaukee Brewers. Up next: The Sabres headed to New Jersey after the game and will practice Sunday in Prudential Center. They meet the Devils there Monday night and complete a back-to-back Tuesday night in Ottawa.